With any retaining wall project, inspection and testing requirements should be established before providing a design. An independent testing firm should be hired by the owner to provide these services. 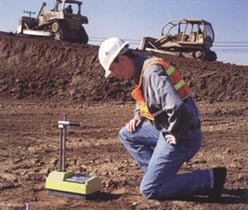 The size and scope of a project will determine the levels of testing and inspection, and testing frequency should be set to establish a proper compaction protocol. One test for every 8 in (20 cm) of vertical fill placed and compacted, for every 25 lineal ft (7.6 m) of retaining wall length, starting on the first course of block.